As alumni flock back to the College this Homecoming weekend, the bonfire will not be their only destination — many will return to the Greek houses they spent countless hours in as students. These organizations, they recall, provided tight-knit groups of friends that last to this day. Daukas, who has served on his fraternity’s board of directors since the 1980s and created the ad hoc Committee to Support Greek Letter Organizations while president of the Alumni Council, cited the sense of community he felt at Kappa Sigma as a central reason for his continued involvement with the College. In its work on the Greek system, the ad hoc committee looked at faculty and alumni engagement, physical plants and long-range planning. Claire Riley ’99, who joined Sigma Delta sorority her junior fall, also echoed the inclusive atmosphere of Dartmouth’s Greek system. She said that Sigma Delt was a welcoming environment and its local status allowed it to host its own social events. “It wasn’t just the fraternity houses, which balanced the playing field,” Riley said. Riley, who now lives in Manhattan, said she still keeps in touch with many sorority members and returns to Hanover about three times a year. Forty-five years after graduating, John Mathias ’69 said he vividly remembers his days as a brother of Phi Delta Alpha fraternity. Mathias, a former president of the Dartmouth Association of Alumni, said that he often wonders how the social scene has changed since he has left the College. His Greek house was a designated place where he could meet up with friends and have fun, he said. Alumni interviewed said their Greek affiliation continues to a play a role in their lives today, largely due to the strong alumni networks of fraternities and sororities. Betsy Booth ’87, a social worker for several public schools and the district enrollment director for the Dartmouth Club of the Piedmont in North Carolina, was a member of Kappa Alpha Theta sorority, now Epsilon Kappa Theta sorority, as an undergraduate. The president of the sorority during her sophomore summer, Booth said she believes there is a strong EKT alumni network, and that current students and recent graduates often contact alumni for advice. Current EKT president Emily Reeves ’15 wrote in an email that EKT has excellent alumni connections. She added that she has reached out to EKT alumni about their companies and industries and has always found them willing to speak with her. Charles Budd ’91, a member of Chi Gamma Epsilon, said he is contacted “somewhat regularly” by Dartmouth students for advice about career opportunities but does not favor those from his fraternity. Budd said his Greek affiliation does not play a role in his decisions to give back financially to Dartmouth, but he would be less likely to support the College if it took measures to drastically alter or abolish the Greek system. Strong alumni networks also aid Greek letter organizations in collecting donations, which go toward functions including dues scholarships and house costs. Taylor Watson ’16, who was president of Sigma Phi Epsilon fraternity in the summer, said that Sig Ep alumni consistently look for opportunities to help the fraternity. Sig Ep’s house, which opened in 2011, was financed largely by alumni donations, Watson said. While he said the fraternity is grateful to have alumni who give back financially, Watson emphasized that having alumni who give their time and effort is equally important. He said alumni in fields he is interested in have been helpful resources as he prepares to enter the job market. While her affiliation with a Greek house was a “positive experience,” Riley said that the sense of belonging she found at the College also plays a part in her continued involvement in the community. 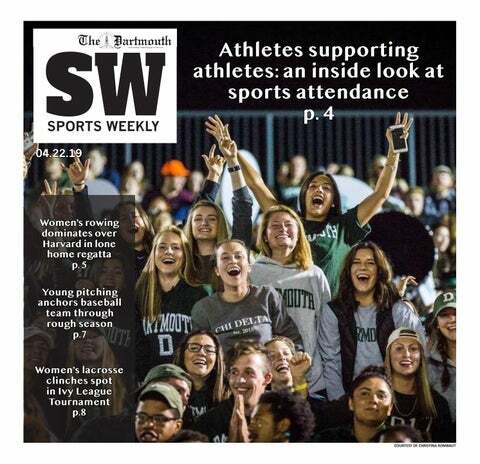 “Dartmouth was a safe place to grow up, and I feel like you grow up a lot during college,” she said.